About a week ago on twitter I asked if anyone would be interested in a candle collaboration post and three lovely bloggers responded. We decided that the collaboration would be more interesting if all four of us did this together. It is always nice to meet new bloggers and share different or similar interests we have. So I was excited to do this collab post! These bloggers are unique and have their own style of blogging which is nice! So be sure to check out their blog and collab post here: Cece, Rachael Claire, and Charlotte. Since it's fall, and winter will be here soon, candles are a must. At least for me it is, I love candles! As soon as I light the candles, I can smell the scent immediately. Sometimes I have more than one lit. I choose specific candles to light depending on the mood I'm in. Does anyone else feel that way too? Candles are calming and relaxing. The time I light candles the most is around 7pm or 8 pm. On the candle it says it is only supposed to stay on for about 2-3 hours. So that is perfect because on most nights I go to bed around 10:30 pm. I think that candles help me sleep I night. I think after I blow the candles out the aroma is still there, so it helps me through the night. Usually I get up in the middle of the night. 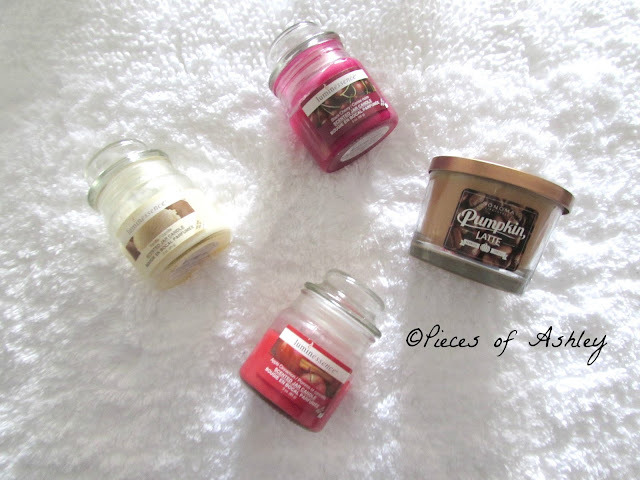 For this post I am going to talk about my favorite candles that I have been using at the moment. I do have others, but I have not used them yet. When it comes to candles I do not think about the brand. Is that weird? But these candles are from luminessence and the other from Sonoma. The three smaller candles were a $1 and the bigger candle was on sale for $4.99, but the regular price is $9.99. Even though some are a dollar, they are still great quality. So it does not matter whether one is a higher price. They still work the same! • This is one of my favorite scents. I think of vanilla ice cream when I smell this candle. Actually anything vanilla flavored! As you can see, I've been using this candle quite often. You can't go wrong with this scented candle. It's one of the basic scented candle but the smell is amazing! • When I smell this scent, I think of thanksgiving and all the foods and desserts that use cinnamon. Like apple pie, candy yams, cinnamon rolls, and pecan twirls. I don't eat pecan twirls often, but that's what I think of when I smell this candle! This candle smells so good, it unbelievable! • This scent is very strong, but it has become one of my favorites. I think of cherry pie when I light this candle. So if your favorite pie is cherry you should definitely get this candle. • I have never had a pumpkin latte before. Actually I never had any latte before. I have no idea what it tastes or smells like, but if it's like this candle it must be really good. On the bottom of the candle it says " This delectable, fall drink blends a touch of bright, juicy fruits into a creamy latte of white pumpkin and steamed milk. Maple sugar and vanilla bean add a hint of sweetness." I think I might try a latte! I hope you enjoyed reading this post as much as I enjoyed writing it! Don't forget to check out these lovely bloggers! in wintertime yankee candles are essential! I love the good smell of them!! I've never tried yankee candles before, but they are very popular. I should try them!